Cirque du Soleil is coming to Winnipeg with its 42nd creation and first ever on ice experience. Cirque du Soleil’s CRYSTAL, explores the artistic limits of ice for the first time in the company’s 34-year history. This unique production pushes boundaries of performance by combining stunning skating and acrobatic feats that defy the imagination. 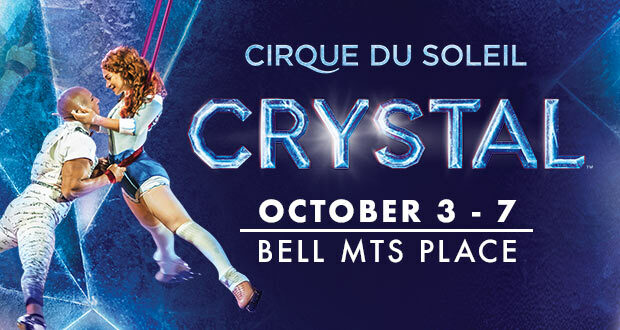 CRYSTAL will be presented at Bell MTS Place from Wednesday, October 3 to Sunday, October 7, 2018 for 7 performances only. October 3 at 7:30 p.m.
October 4 at 7:30 p.m.
October 5 at 7:30 p.m.
October 6 at 4 p.m.
October 6 at 7:30 p.m.
October 7 at 1:30 p.m.
October 7 at 5 p.m.